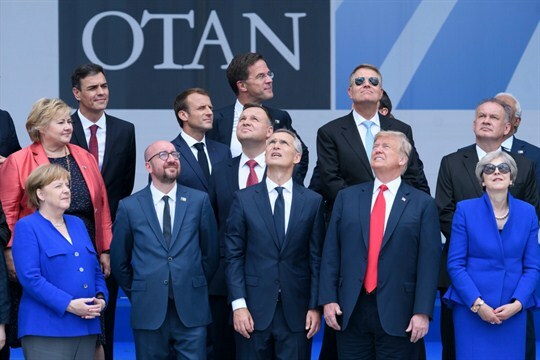 German Chancellor Angela Merkel, Belgian PM Charles Michel, NATO Secretary-General Jens Stoltenberg, U.S. President Donald Trump and U.K. PM Theresa May at the NATO summit, Brussels, July 11, 2018 (Sipa photo via AP Images). The mood will be somber rather than celebratory when NATO foreign ministers gather Thursday in Washington to commemorate the organization’s 70th birthday. History’s most successful multilateral alliance has had quite a run. A tranquil retirement, however, is not in the cards.